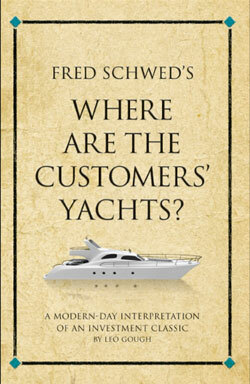 Fred Schwed’s Where are the Customers’ Yachts? The title of this 1955 book refers to a story about a visitor to New York who admired the yachts of the bankers and brokers. Naively, he asked where all the customers’ yachts were. Of course, none of the customers could afford yachts, even though they dutifully followed the advice of their bankers and brokers. Full of wise contrarian advice and offering a true look at the world of investing, Where Are the Customers’ Yachts? continues to open the eyes of investors to the reality of Wall Street. Here, Leo Gough’s interpretation of Where Are the Customers’ Yachts? illustrates the timeless nature of Fred Schwed’s insights by bringing them to life through 52 modern case studies. This brilliant interpretation is an entertaining accompaniment to one of the most famous books on investment ever written.